Caregivers face challenges of every type. Caregivers help persons with physical disabilities, aged persons, injured individuals, and persons struggling with a mental illness. Regardless of the cause, it is important, whether you have volunteered for the role, or it has been thrust upon you by circumstances unfortunate and unexpected, to learn how to deal with the issues that arise in a way that reduces stress and strengthens preparation and flexibility. NAMI provides help for caregivers of persons with a mental illness. To get started with NAMI’s resources, START HERE..
Caregivers.com is not associated with NAMI. Do your own diligence. NAMI South Bay shares this information because it has become aware of the resource, but is not in a position to recommend, endorse or guarantee services or outcomes. Most of us will be at some point in our lives, or are, caregivers. 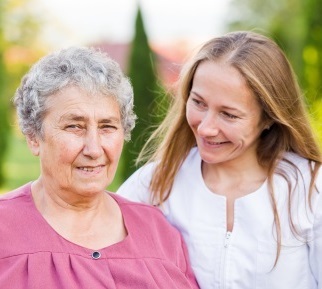 A person with a severe mental illness may require a caregiver. Or as loved ones age, health conditions or frailty can soon follow. While some persons requiring assistance can rely upon paid providers, most rely on unpaid assistance from families, friends and neighbors. Following are a few tips for a caregiver to keep in mind. Recognize that you are a loving family member and/or friend and not a magician. None of us can change anyone else; we can only be supportive of ourselves and our loved one as each of us attempts to find ways to manage mental illness. Focus on the good things that happened during each day. Realize that we all have physical and emotional limits. Do not blame yourself or others if that limit is reached. Find pleasurable places to go each day. Find a place where you can be alone. Use it whenever you need it. Be gentle with yourself. Spend some time away from the person with mental illness. Avoid activities that increase your levels of tension. Inject humor in your life. Learn to set limits and to make choices. Learn to say “no”, what is your “yes” worth? Use the expression “I choose to” rather than “I have to,” or “I should.” Learn to say “I won’t” rather than “I can’t.” Take care of your own nutritional and sleep needs. Establish short term and long term goals for yourself. You may find it useful to keep a journal. Realize that you should continue your leisure activities, your relationships with others and your hobbies. Enjoy your life!